Saraswati Puja is observed mainly during Basant Panchami and Navratri in a year. Saraswati Puja 2019 during Navratri it is from October 5 to October 8. Saraswati Puja is the worship of Hindu goddess of learning. In Kerala, Saraswati Puja is known as Vidyarambham and it is observed on the Vijayadasami day and in 2019, it is on October 8. Saraswati Puja is also observed during Navratri (October – November) in North and western parts of India. The puja includes worship of a new idol of Goddess Saraswati and its final immersion in a water body. In South India during Navratri, Goddess Saraswati is worshipped on the last three days of Navratri. In 2019 is from October 6 to October 8. Puja Vyappu or the keeping of tools and implements for puja is on the evening of October 16. On the Navratri Vijayadashami day, children are initiated into the world of learning in Kerala. This ceremony is known as Vidya Arambham and it is on October 8, 2019. Goddess Saraswathi, or Sarasvati, is the Goddess of wisdom and learning in Hinduism. Saraswati Puja on Basant Panchami (January - February) day is observed annually in North and Eastern parts of India. The main event on the day is the initiation of children into the world of letters and knowledge. Children are taught to read and write for the first time on this day. The day is considered to be the most auspicious day in a year to initiate children into the world of learning. Education institutions organize special Saraswati puja on this day. 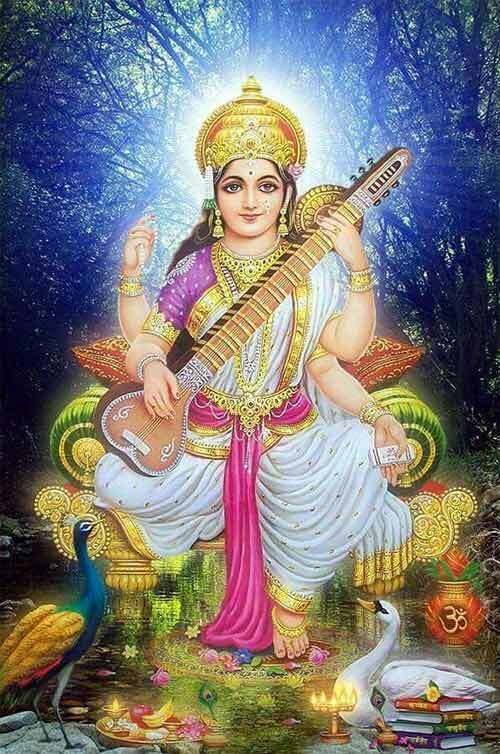 Goddess Saraswati is the goddess of knowledge, art and music, and wisdom. She represents the creative and inspirational aspect of Shakti. Legend has it that there was chaos in the world created by Lord Brahma. There was no peace and prosperity. There was no creativity. He then realized that only knowledge can help the universe from self destruction. Goddess Saraswati then appeared from the mouth of Brahma riding a swan. She was holding a veena and the Vedas. She thus brought rhythm and knowledge into the universe. To Hindus all knowledge is sacred as it is the blessing of Goddess Saraswati. She bestows both spiritual and worldly knowledge on us – we have to decide what we need. She symbolically represents the unity of all knowledge. She is like the river – we need to decide how we want to use the river to nourish and flourish or to become selfish and unleash the destructive power of the river. Saraswati is also known as Vani (speech). The swan of Saraswati symbolically represents purity – purity of thought and action. We should develop the ability to find food (knowledge) in mud like swan. We should develop discrimination like the Swan which is separates milk from water. Its wings do not get wet that shows we should not be attached to anything. Do the work and then move ahead. What Is Done on Saraswati Puja Day? She is worshipped for knowledge that remove ignorance. Saraswati puja is observed during that period of the year when Nature is afresh and blossoming. Thus symbolically the puja represents the removal of gloominess and ushering in of freshness. The main event on the day is the initiation of children into the world of letters and knowledge. Children are taught to read and write for the first time on this day. The day is considered to be the most auspicious day in a year to initiate children into the world of learning. Education institutions organize special Saraswati puja on this day. On the day, the idol of Saraswati is dressed in white or yellow color. Yellow color plays an important role in Saraswati Puja. Yellow color symbolizes the onset of spring and new enthusiasm. Fresh fruits and flowers are offered to Goddess Saraswati.